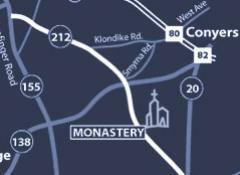 The Monastic Heritage Center opened May 6, 2011, and is one of the Monastery’s newest facilities. Begin your visit here and experience a day of discoveries. The Monastery of the Holy Spirit unveiled the new Monastic Heritage Center on May 6, 2011. The 17,000-square-foot complex incorporates both new and renovated historic Monastery structures and integrates elements of learning and hands-on activities to create a unique welcome center. The Monastic Heritage Center brings together our public spaces: The Visitor Center and Historic Barn, the Abbey Gift Shop and Café, the Abbey Garden Center, the Bonsai Nursery and Green House, the Central Courtyard, and the Memorial Plaza and Prayer Walk.